888sport online bookmaker is a part of the 888 Group, a company which was established in 1997 and which now operates several high-profile gambling websites. The 888 Group have almost 900 full-time employees in offices spread all around the world. 888sport.com itself is operated by Gibraltar-based Cassava Enterprises, an operating subsidiary of the 888 Group. In 2005, 888 Holdings Plc, the group's holding company, listed their shares on the London Stock Exchange. 888.com received many awards and a few of these deserve particular mention. In 2007 and 2008, the website took the title of Best Betting and Gaming Company by Leisure Report Awards, for originality and overall performance. Moreover, at 2008 Leisure Report Awards 888.com received Operator of the Year award. In 2007, at the Gambling Online Magazine Awards 888.com was bestowed the Gold Reader's Choice Award for Top Casino, the achievement which has been equaled by 888.com to winning an Oscar. Last but not least, at the 2007 eGaming awards, 888.com won Best Online Casino award. This is another British online sportsbook that is developing at a very fast pace. The company has received a number of important awards for its activities on the Internet. In 2012 and 2011,, during the awards ceremony eGR Awards, 888Poker was entitled Poker Operator of the Year. In 2010, 888Sports won in the category The Socially Responsible Operator of the Year according to eGR Awards. 888.com was established in 1997 by Avi and Aaron Shaked and Shay and Ron Ben-Yitzhak as Virtual Holdings Limited. Initially, their offices were based in Antigua. In the same year, they launched their first proprietary product – Casino-on-Net, which now boasts more than 13 million customers served. Consequently, new online products were added to the offer – in 2002 it was Reef Club Casino with unconventional underwater background, and Pacific Poker, a multi-player online poker room. As soon as 888.com received a gaming license in Gibraltar in 2003, they relocated their administration to this British overseas territory. In 2004, the company launched a new betting exchange – Betmate.com. The site is operated by Global Betting Exchange and trades under the name BETDAQ. Betmate.com offers exchange on horse racing, soccer, tennis, rugby, politics and a few more disciplines. As far as sports betting is concerned, 888sport.com bookmaker covers many disciplines from team sports (e.g. soccer, basketball, rugby, aussie, American football), through player tournaments like snooker and golf, to major horse racing events held in the UK, Australia and Hong Kong. With 888.com one can also enjoy online casino, poker, refurbished and diverse games section (with such categories as hi/lo, keno, slots, scratchcards, sports, table games), and bingo. Top snooker players, such as John Higgins, are sponsored by the bookmaker. 888sport is also known for their interest in darts. They were the title sponsor of the Premier League Darts in 2005, and since 2003 they're a sponsorship partner of 12-times World Darts Champion, Phil Taylor. Additionally, 888.com bookmaker sponsors the World 8-Ball Pool Championships, 8-Ball International Pool Masters, 9-Ball World Pool League, as well as 9-Ball World Pool Masters. In 2008, Shane Warner, former well-known Australian cricketer, entered a partnership contract with the company, and since then he has represented 888.com's casino and poker room at international poker events, such as the World Series of Poker. 888.com supports Warner’s work for ill and marginalized children (Shane Warner Foundation). 888.com was also the sponsor of Spanish La Liga club Seville FC, but before the inauguration of 09/10 season both sides decided to end their partnership. 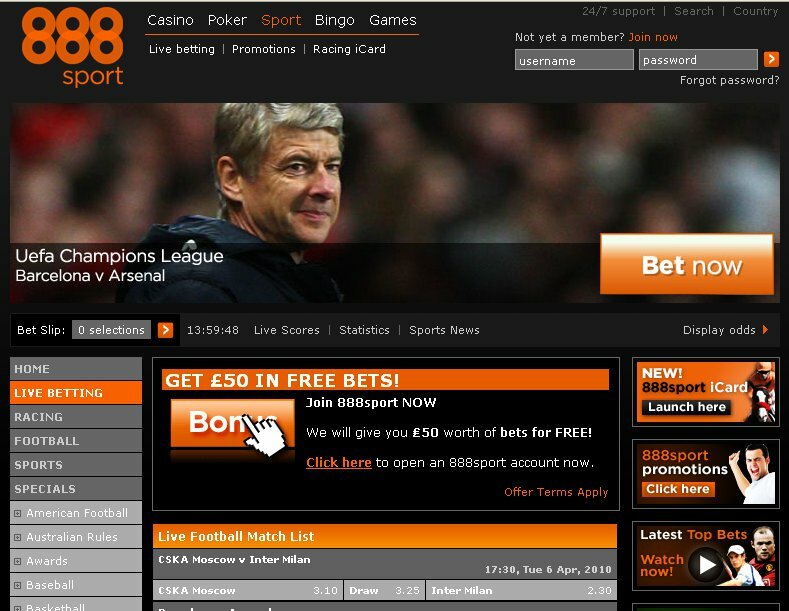 888sports bookmaker has been the main sponsor of the English club Middlesbrough, which is playing in the Football League Championship, for several years. Moreover in the past, the company also sponsored a French football club Toulouse. Residents of the following countries are not accepted at 888sport: Israel, Turkey, United States of America.